When a bestselling father and a son building a very credible reputation as a novelist decide to collaborate on a book, the results can be quite different from anything either has published. The Golem of Hollywood is an astonishing departure for both Jonathan Kellerman and his son Jesse; a gritty procedural wrapped in an ancient Hebrew myth with supernatural elements. According to Jewish legend, in the late 16th century Rabbi Loew ben Bezalel of Prague created the Golem out of straw and mud, to protect the Jews of the city from persecution. Some say the Golem is still hidden in the attic of a synagogue there, waiting to be awakened to prowl the streets of Prague again. In the Kellermans' book, centuries later, Jacob Lev's late mother had earned quite a following with her molded clay figures. Jacob, an alcoholic detective and fallen-away Orthodox Jew, is at extreme risk of being fired. He has been busted down to Traffic Division when he is suddenly transferred into a top secret "Special Projects" Unit. It is so secret that he must work from home, entirely alone, although two muscular men show up at intervals––usually when he is in danger. He is given the use of a car and a credit card (that sometimes works), as well as a phone and computer. The first case he is assigned involves a beheading, with only the head found. On a counter near the head the Hebrew word for "Justice" has been burned into the surface. When the DNA of the head is found to match that of a serial killer who had apparently operated for several years in countries around the world without being caught, Jacob's search widens, taking him first to Prague, then to Oxford, in search of answers. The biblical story of Cain and Abel is an integral thread that weaves throughout this novel. These first sons of Adam and Eve had taken offerings to the Lord. Cain, a farmer, took fruits and grain. Abel, a shepherd, sacrificed a lamb. God was pleased with Abel's gift, but not with that of his brother. (So much for vegetarianism!) 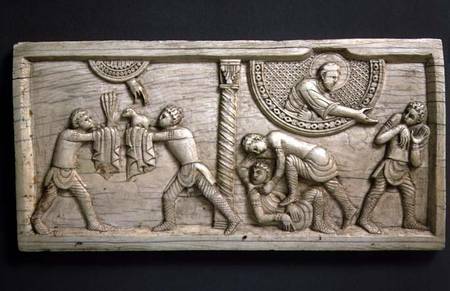 Cain, in a fit of jealousy, killed Abel with the jawbone of an ox, thus becoming the first recorded murderer. The authors have carried this story further along, in the person of a sister who was very fond of her brother Cain. She tracks him from place to place, finally catching up with him in a city he has built and rules. Chapters relating this extension of the biblical story are interspersed throughout the contemporary mystery for quite some time before the story lines finally connect. This secondary story is nearly as interesting as the first, and I sometimes had trouble disconnecting and reconnecting with the contemporary tale. There are other minor threads, one of which recounts the tale of the creation of the Golem. In this book, all roads lead to Prague, and it is there that Jacob's connection with the biblical part of the story begins, centuries ago. I suspect that the beautiful beetle that can become a woman who follows Jacob throughout his adventures is entirely a product of the authors' imaginations, rather than part of the legend, but I am not sure. At 560 pages, The Golem of Hollywood is a long book; part mystery, part supernatural, and part mythic. I suspect the authors are well versed in both classical literature and Judaic legend, and had a lot of fun weaving these disparate stories together. For me, as one unversed in this rich tradition, it was a bit like looking at a Chagall painting: brilliant and jeweled, but the deeper context may be out of my grasp. It is a more complex and deeper book than I have read from either author, and much better than even their well-written mysteries. A sequel is planned for next year, tentatively called The Golem of Paris. I am looking forward to reading it. Note: I received a free advance review copy of The Golem of Hollywood, which will be released by Putnam Adult/Penguin Group (USA) on September 16, 2014. After reading the Golem of Hollywood and about 20 reviews, this was definitely the best summary. Thank you for pulling it all together. Our friend Periphera is off at the moment, so I'll thank you on her behalf for the wonderful compliment.